With support from the Ontario Ministry of Economic Development and Growth (MEDG), Mowat NFP developed this report to examine the concept of common impact measurement frameworks and standardization globally, and identify specific opportunities to strengthen impact measurement practices for the social enterprise ecosystem in Ontario. Although the potential for their growth is significant, measuring the social impact of social enterprises is a persistent challenge. Not only is it difficult to distill social impact to a set of ‘neatly communicated simple metrics’, but there is also no common, proven method, code of practice, or core model to follow.2 For social enterprises working towards both social and commercial objectives, the ability to clearly articulate and demonstrate social impact3 is critical for building confidence, demonstrating accountability among potential funders and investors and establishing trust with the broader community. More importantly, good impact measurement practice can improve how an organization functions, drive efficiencies, and be a tool to achieve greater impact. A review of the literature and consultations with leading practitioners and organizations revealed that significant efforts have been undertaken to establish common approaches, develop effective measurement tools, and identify robust metrics for social enterprises. However, the diversity of players in the social enterprise ecosystem has made it difficult to find common ground and develop a coordinated solution. In June 2016, the Government of Ontario launched a new five-year Social Enterprise Strategy designed to support social enterprises to grow, enter new markets and create jobs while also addressing complex social and environmental challenges. The strategy included the creation of a new Impact Measurement Task Force to explore uniform impact measurement standards for social enterprises. In addition to a comprehensive literature review, Mowat NFP undertook a set of key informant interviews, a pre-forum consultation and public forum. Through the events, international leaders and innovators in social enterprise impact measurement provided fresh insight into the measurement challenges currently facing not-for-profit and for-profit social enterprises. They shared emerging trends, discussed the development of common frameworks and standardization abroad and shared key learning. The events leveraged local expertise, built on past social enterprise impact measurement initiatives in the province and brought together a diverse range of leaders, funders and investors. 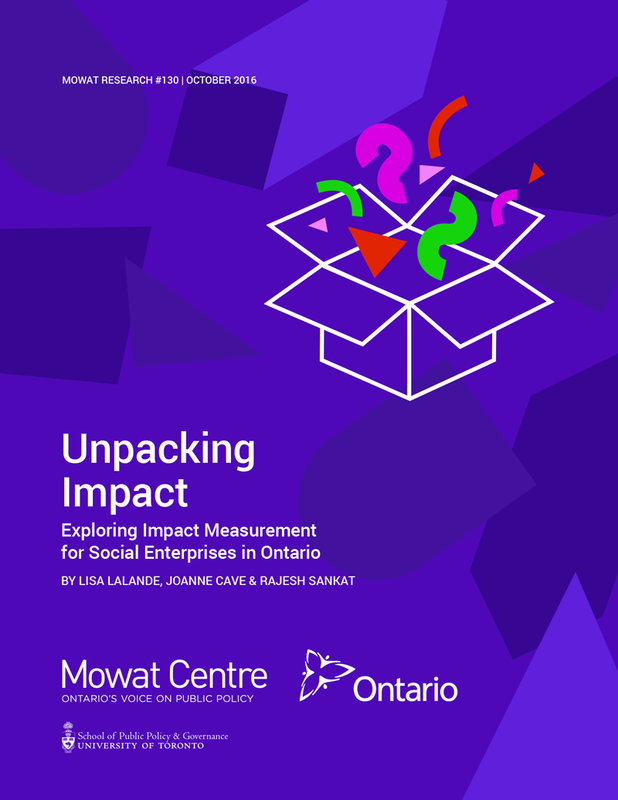 Provides context on the issue of impact measurement for social enterprises in Ontario and distills the challenges into key themes. Identifies leading impact measurement practices for social enterprises globally. Provides recommendations on a way forward for all actors in the social enterprise ecosystem.